This year marks a milestone for Dawn’s wildlife partner, International Bird Rescue (Bird Rescue) – it has been 45 years since the oil spill that led directly to the creation of Bird Rescue. In January 1971, two oil tankers collided in foggy conditions near the Golden Gate Bridge. The ruptured tankers spilled at least 800,000 gallons of crude oil, affecting 7,000 birds. Volunteers collected nearly 4,300 of them and brought them to makeshift rescue centers, but only about 300 birds were successfully rehabilitated and released. Following the spill, Bird Rescue was officially hatched in April of 1971 at Berkeley’s Aquatic Park. Since then, it has led oiled bird rescue efforts in over 220 oil spills in more than a dozen countries. Dawn joined Bird Rescue at their San Pedro, Calif. facility this weekend where community guests got a behind-the-scenes look at the impactful and profound work happening at the wildlife rescue center. The anniversary celebration also featured guest speaker and photographer Joel Sartore, who photographed oiled wildlife during the Deepwater Horizon spill for National Geographic. 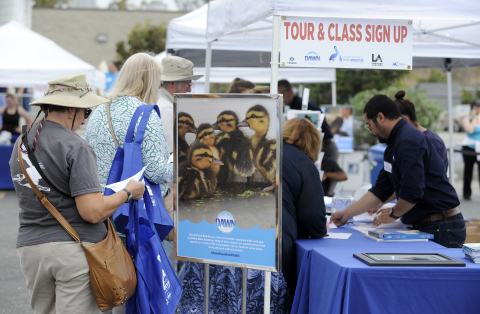 In their 45th year, Bird Rescue continues to bring excellence in marine bird response and rehabilitation, as well as a renewed focus on research, education, and outreach, especially to children, the next generation of wildlife and nature stewards. To join Dawn in supporting marine wildlife, consumers can visit bird-rescue.org. For more information about the Dawn family of products, visit www.dawn-dish.com. For 45 years, International Bird Rescue has been a global leader in responding to man-made disasters affecting wildlife, such as oil spills and marine debris. In addition to a fully-equipped emergency response center in Alaska, Bird Rescue runs two world-class wildlife centers in California which care for more than 5,000 animals each year, including pelicans, herons, shorebirds, and other aquatic species. This is made possible by over 60,000 volunteer hours kindly provided by a diverse group of retirees, nurses, veterinary students, and others. To date, their response teams have led rescue efforts in more than 200 spills across six continents. Visit www.Bird-Rescue.org to learn more.